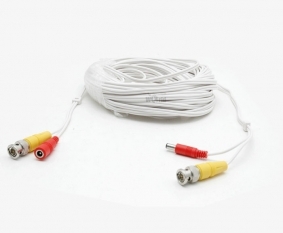 Siamese cables for use with CCTV cameras are usually only Video & Power. This 50ft cable is a special one we carry just for use with security cameras with built-in microphones or with add-on microphones. You could even use this to connect two cameras over one cable by using BNC to RCA connectors, and a 1 to 2 DC power splitter. This cable is thin and malleable, and great for use indoors or outdoors underneath cover. 30 Days Return Policy. Used cabling not eligible for returns or exchange.